The federal Secure Rural Schools and Self-Determination program has expired after years of declining and uncertain payments to counties and schools. A bipartisan group of senators is seeking to reauthorize the program that is intended to compensate rural counties for lost revenues from the decline in timber harvests on federal land. To be sure, the program has served as a critical source of revenue for counties that are dominated by land in federal ownership, and the loss of payments will result in further reductions to many county budgets that are already been cut to the bone. It’s time for Congress to turn this challenge into an opportunity by addressing the underlying challenges facing our counties, communities, and federal lands. Though renewing Secure Rural Schools payments will help prevent damaging budget cuts in the short-term, it will not fix the high unemployment and poverty many of our communities have been experiencing for the past 20 years. That’s why we need a long-term solution that restores more active, science-based management to our national forests. 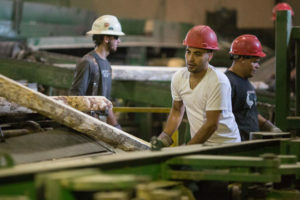 Sustainably increasing timber harvests on national forests will help create family-wage jobs in the woods, in wood processing facilities, and in the many businesses that benefit from a strong forest sector. Revenues from these sustainable timber harvests would help counties fund critical services, from road maintenance to law enforcement. And importantly, active management will help restore the health of our national forests. These low harvest levels contribute to overstocking, increased wildfire fuel loading and an elevated risk of insect and disease attacks. Reducing the future risk of catastrophic wildfires, promoting forest health and ensure adequate access on public lands is also critically important to maintaining and growing the tourism and outdoor economy in our rural communities where unemployment rates are typically two to three times the unemployment rate in urban areas. Using the best available science, forest management activities such as timber harvests and thinning can help reduce the risks to our forests while supporting family wage jobs in our rural forested communities. It also offers a long-term solution to the annual uncertainty over Secure Rural Schools payments. Let’s urge Congress to support such a long-term plan that puts people back to work while helping our rural communities regain self-sufficiency.